While the world is waking up this morning, the finest athletes from across the planet are gearing up for one of the most arduous challenges of their sporting careers, the 22nd Olympic Games. And though we haven’t reached the Opening Ceremony yet (which is Friday, Feb. 7 at 11 a.m. EST, but NBC will delay airing in the U.S. until 7:30 p.m) the social conversations have been heating up, though not exactly as officials had hoped. #SochiProblems has emerged as one of the top keywords of the 22nd Winter Olympics, beating out Team USA, Putin and Opening Ceremony in number of mentions. 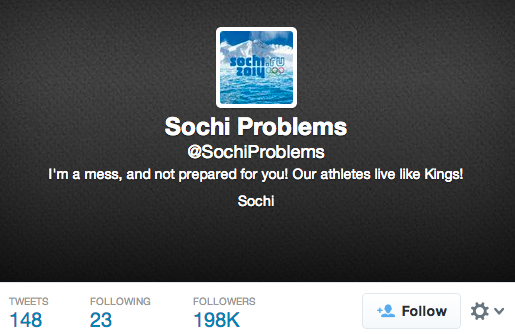 What started as a hashtag documenting the issues facing journalists and athletes making the trek to Russia, @SochiProblems is now a full blown parody Twitter account, and has racked up nearly 200,000 followers (by comparison the official @Sochi2014, is being followed by around 150,000 people). Digimind Social pulled some early numbers on sentiment around these conversations and found some interesting trends. 3. Putin – A top concept, this time, because upon arriving in Sochi he was photographed petting a (tame) snow leopard. 5. Security – A major concern as the Olympics begins, with multiple threats to the games having already been publicized. Despite these concerns on the games, those online are still feeling “good” about #Sochi2014 with 81% of of online conversations around the hashtag remaining positive. Brands are starting to tap the #SochiProblems trend too, with Clorox the clear winner so far with this perfectly timed tongue-in-cheek graphic playing off of the most infamous Sochi photo, the twin toilet.